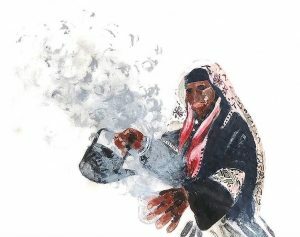 Tea Afar: Jordan will be presented on Saturday, July 14, from 6 to 9 p.m. at the James Irvine Garden, Japanese American Cultural and Community Center, 244 S. San Pedro St. in Little Tokyo. “Tea Afar is a nomadic storytelling experience that shares traditions and rituals across borders,” event organizers said. “Over tea, we tell stories about one country. For this collaborative edition we will ‘visit’ Jordan and its unique position as a refuge for the Middle East region. “Through storytellers, a tea master, photography, music, and food, we’ll take a full sensory international journey. For one evening only, join us in an intimate setting in the lush and tiered James Irvine Japanese Garden. Food by Add A Little Lemon will be served. All participants will be treated to a cocktail, small bites and tea. Susu Attar is a multi-media artist and a Little Tokyo Service Center +Lab artist-in-residence at the JACCC. She was born in Baghdad and raised in Los Angeles. Her works draw from travel between both cities, exploring the space between diasporic memory and the documentation of loss. April Banks is a Los Angeles-based conceptual artist, traveler, and the producer of Tea Afar. For over a decade she made art that raised awareness and pointed to the global disparity in food security, farmers’ rights and fair trade. She now turns her focus to the ways we come together across divides. Ramy Eletreby is a theater artist, writer, performer, and arts-based educator from Los Angeles who facilitates creative projects at the intersection of arts and social justice with various communities throughout the greater L.A. region. He has worked with Center Theatre Group, Geffen Playhouse, youTHink, Free Arts, Urban Possibilities and for the City of L.A.’s Department of Cultural Affairs. This is a free event but donations are greatly appreciated. No late seating. Must be 21+. For more information and to RSVP, call (213) 628-2725 or visit www.jaccc.org.